Author-poet Carl Sandburg was born in the three-room cottage at 313 East Third Street in Galesburg on January 6, 1878. The modest house, which is maintained by the Illinois Historic Preservation Agency, reflects the typical living conditions of a late nineteenth century working-class family. Many of the furnishings once belonged to the Sandburg family. Behind the home stands a small wooded park. There, beneath Remembrance Rock, lie the ashes of Carl Sandburg, who died in 1967. Carl August Sandburg was born the son of Swedish immigrants August and Clara Anderson Sandburg. The elder Sandburg, a blacksmith's helper for the nearby Chicago, Burlington and Quincy Railroad, purchased the cottage in 1873. Carl, called "Charlie" by the family, was born the second of seven children in 1878. A year later the Sandburgs sold the small cottage in favor of a larger house in Galesburg. 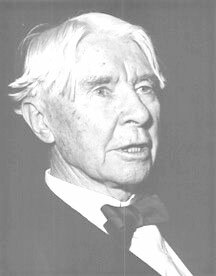 Carl Sandburg worked from the time he was a young boy. He quit school following his graduation from eighth grade in 1891 and spent a decade working a variety of jobs. He delivered milk, harvested ice, laid bricks, threshed wheat in Kansas, and shined shoes in Galesburg's Union Hotel before traveling as a hobo in 1897. His experiences working and traveling greatly influenced his writing and political views. As a hobo he learned a number of folk songs, which he later performed at speaking engagements. He saw first-hand the sharp contrast between rich and poor, a dichotomy that instilled in him a distrust of capitalism. When the Spanish-American War broke out in 1898 Sandburg volunteered for service, and at the age of twenty was ordered to Puerto Rico, where he spent days battling only heat and mosquitoes. Upon his return to his hometown later that year, he entered Lombard College, supporting himself as a call fireman. Sandburg's college years shaped his literary talents and political views. While at Lombard, Sandburg joined the Poor Writers' Club, an informal literary organization whose members met to read and criticize poetry. Poor Writers' founder, Lombard professor Phillip Green Wright, a talented scholar and political liberal, encouraged the talented young Sandburg. Sandburg honed his writing skills and adopted the socialist views of his mentor before leaving school in his senior year. Sandburg sold stereoscope views and wrote poetry for two years before his first book of verse, "In Reckless Ecstasy", was printed on Wright's basement press in 1904. Wright printed two more volumes for Sandburg, "Incidentals" (1907) and "The Plaint of a Rose" (1908). As the first decade of the century wore on, Sandburg grew increasingly concerned with the plight of the American worker. In 1907 he worked as an organizer for the Wisconsin Social Democratic party, writing and distributing political pamphlets and literature. At party headquarters in Milwaukee, Sandburg met Lilian Steichen, whom he married in 1908. The responsibilities of marriage and family prompted a career change. Sandburg returned to Illinois and took up journalism. For several years he worked as a reporter for the "Chicago Daily News", covering mostly labor issues and later writing his own feature. Sandburg was virtually unknown to the literary world when, in 1914, a group of his poems appeared in the nationally circulated Poetry magazine. Two years later his book "Chicago Poems" was published, and the thirty-eight-year-old author found himself on the brink of a career that would bring him international acclaim. Sandburg published another volume of poems, "Cornhuskers", in 1918, and wrote a searching analysis of the 1919 Chicago race riots. More poetry followed, along with "Rootabaga Stories" (1922), a book of fanciful children's tales. That book prompted Sandburg's publisher, Alfred Harcourt, to suggest a biography of Abraham Lincoln for children. Sandburg researched and wrote for three years, producing not a children's book, but a two-volume biography for adults. His "Abraham Lincoln: The Prairie Years", published in 1926, was Sandburg's first financial success. He moved to a new home on the Michigan dunes and devoted the next several years to completing four additional volumes, "Abraham Lincoln: The War Years", for which he won the Pulitzer Prize in 1940. Sandburg continued his prolific writing, publishing more poems, a novel, "Remembrance Rock", a second volume of folk songs, and an autobiography, "Always the Young Strangers". In 1945 the Sandburgs moved with their herd of prize-winning goats and thousands of books to Flat Rock, North Carolina. Sandburg's "Complete Poems" won him a second Pulitzer Prize in 1951. Sandburg died at his North Carolina home July 22, 1967. His ashes were returned, as he had requested, to his Galesburg birthplace.